Ricky Taylor spun the No. 7 Penske-Acura but recovered to set a 1:47.773 lap at the 3.74-mile track and grab third place ahead of the second Nissan of Pipo Derani. Taylor was just three tenths of a second off the record pole time set by Vautier. As at Daytona, Taylor will share driving duties with Helio Castroneves and Graham Rahal. Vautier briefly went off track in turn 10 early in the session. But on the following lap, he drove past the then-fastest Juan Pablo Montoya in the No. 6 Acura Team Penske Acura ARX-05 DPi car with eight minutes remaining in the 15-minute session. Vautier will co-drive their Caddy with Matt McMurry and Eddie Cheever III. Co-driving with Pla will be Scott Sharp and Ryan Dalziel. 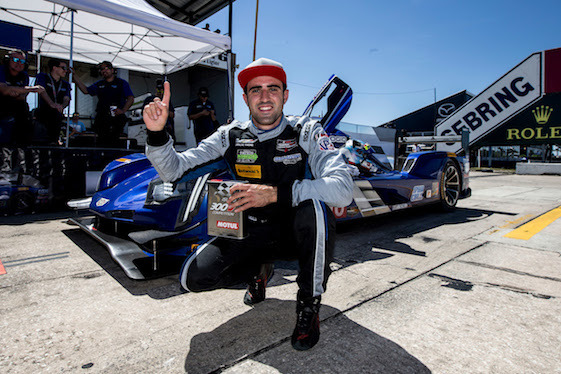 Connor De Phillippi drove the Rahal Letterman Lanigan Racing-run BMW M8 to the pole, edging James Calado in the Risi Competizione Ferrari 488 by .058 seconds. Sharing the wheel with de Phillippi will be Bill Auberlen and Phil Sims and Alexander Sims. Daniel Serra laid down a lap in 1:58.710 in his AF Corse-run Spirit of Race Ferrari 488. Christopher Mies in the Land Motorsport Audi R8, was second. Third and fourth were the 3GT Lexus RC Fs of Jack Hawksworth and Dominik Baumann, with Paul Miller Racing’s Lamborghini Hurcan fifth, piloted by Madison Snow. ExxonMobil announced Friday that it has agreed to a new multi-year deal with Sebring International Raceway, which will see Mobil 1 continue as the title sponsor of the Twelve Hours of Sebring race. This Saturday, March 17, marks the 23rd consecutive year of the Mobil 1 Twelve Hours of Sebring with this weekend’s race.